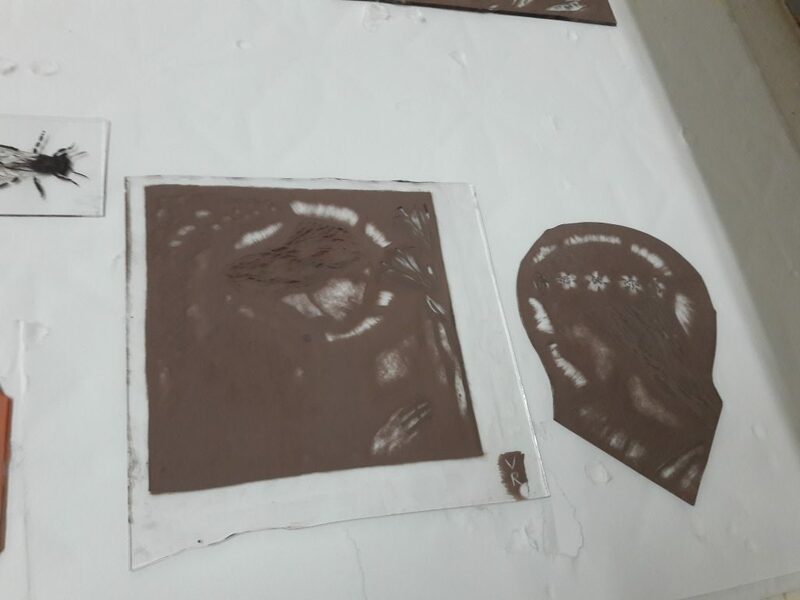 My first was a faces and drapery workshop with Stuart Low at Creative glass. 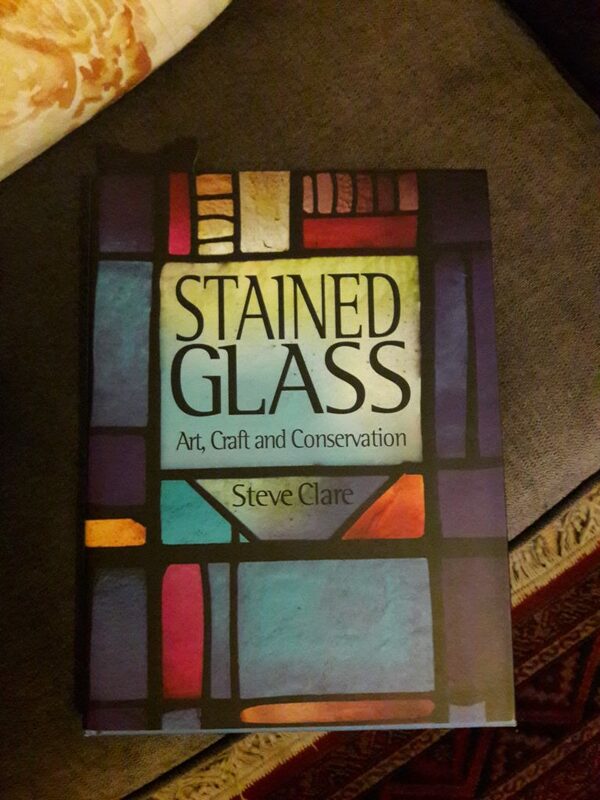 I’m really interested in glass restoration, so it was really fab to visit Bristol for the weekend (& get to stay over at a B&B on the edge of the city) for two days intensive practice, without the usual distractions of home. 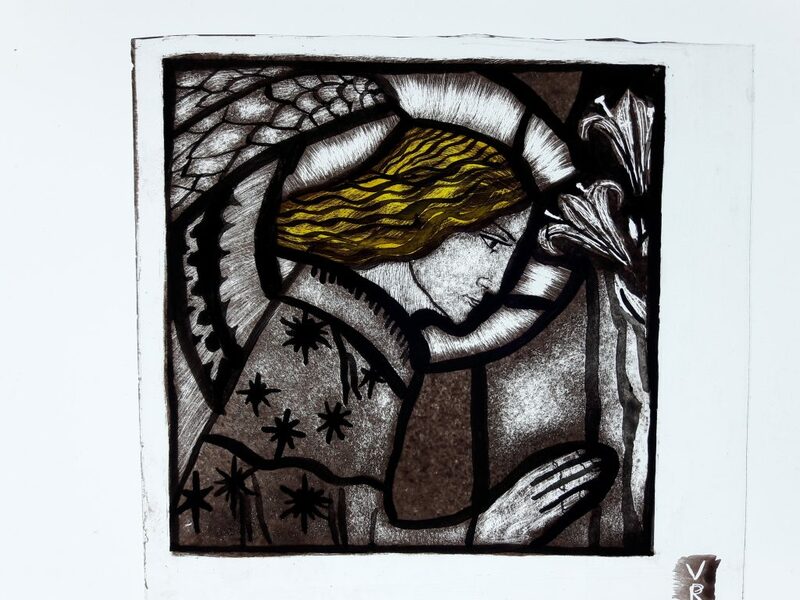 I had taken a few examples of the kind of painted glass I admired with me, and Stuart provided further examples along with guidance and demonstrated techniques for first copying outlines for the first firing and then adding shading, enamels or silver stain. 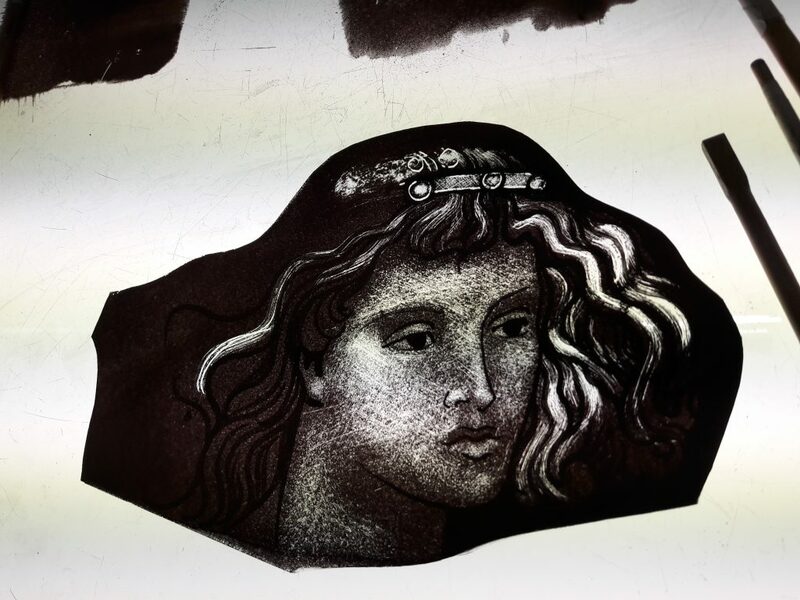 Both of the facial pieces I chose to copy were by a glass artist called Joseph Nuttgens. This wasn’t really a conscious decision, it just happened that they were the two I liked the best (although a medieval King design which Stuart had a photocopy of was also very temping). 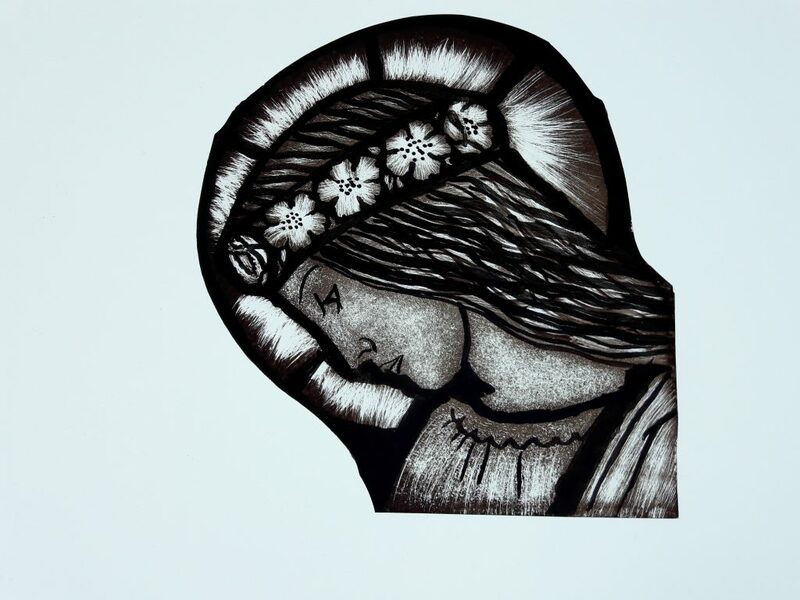 As well as the lady and angel designs I wanted to try and copy a piece of border as this is usually the most common type of glass to require copying as damage is more likely around the outside border of the panel. The first day was very much about getting our outlines right and watching demonstrations of the second layer of paint being applied as well as experimenting with test pieces of a lovely blue enamel and silver stain. 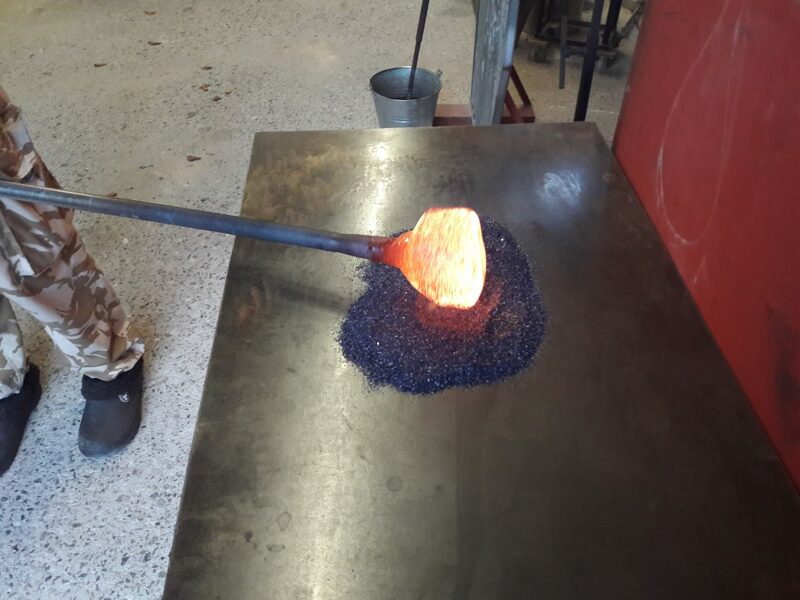 The pieces were fired overnight leaving us to apply the second layer of ‘skin’ the following day. I found this the more difficult of the two as it was hard to know how much paint to take away and how to achieve the effects I was aiming for. Stuart was a great tutor offering advice but also giving us the space to work through problems on our own & it was a very worthwhile class. I had to leave my pieces to be fired for the final time but when they were posted on to me I was very pleased with all of them, especially the lady who I had decided to leave without any stain. And now for something completely different! The next class nearly didn’t happen (& thanks so much to KT and the team at the Glass Hub for ensuring it did). 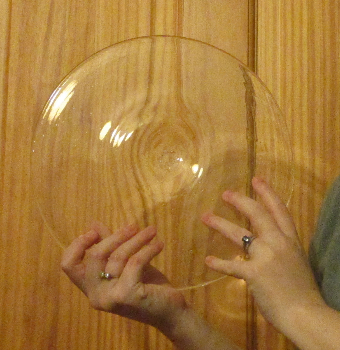 The course was entitled making flat glass. 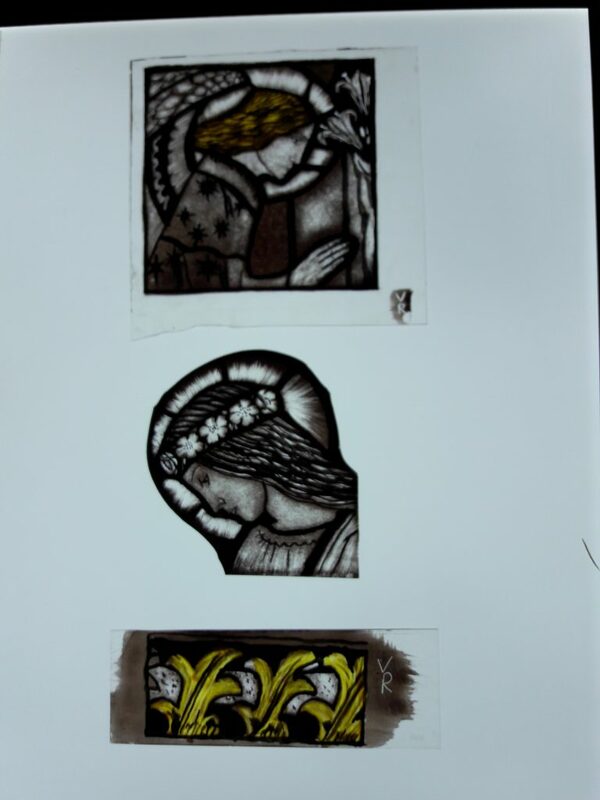 Having had my first experience with mouth blown glass (one sheet of which sadly cracked on me) for artweeks last year I was intrigued to see the process behind the finished product that I use in my stained glass work. 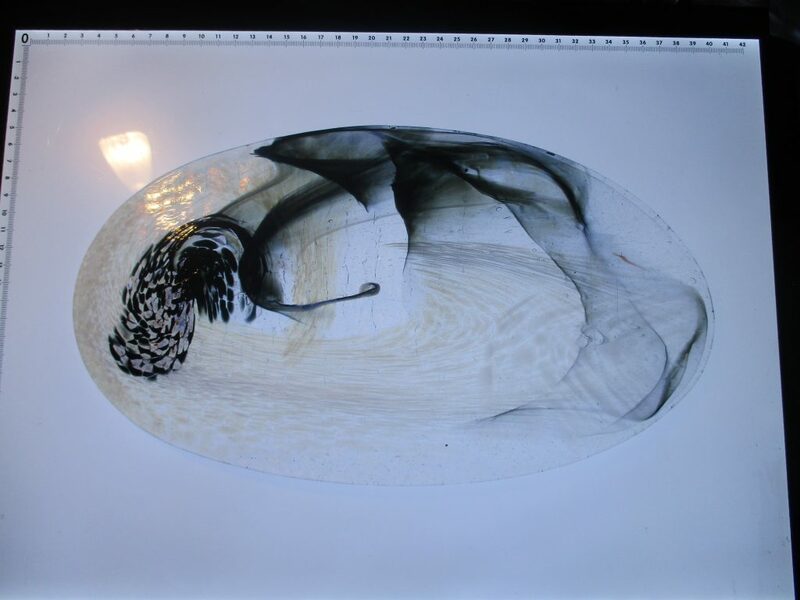 I had up to this point never worked with hot glass before (although a look in my journal tells me it was in fact a resolution for 2017 so perhaps it was on my mind before I spotted this course?) so I was duly wrapped in Kevlar before I was allowed anywhere near the furnace or blowpipes. Our first adventure was to make roundels as they would have traditionally been made. 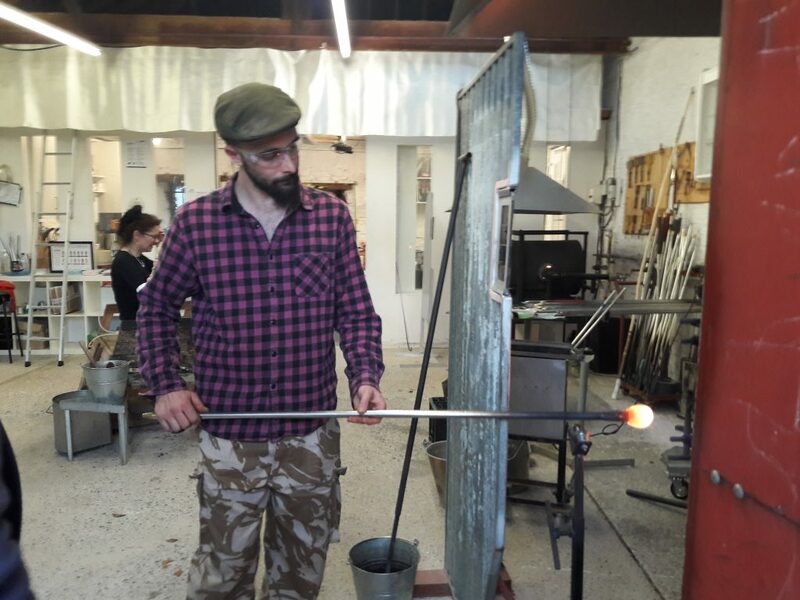 To do this we ‘gathered’ (or in my case helper Olly gathered for me) the molten glass onto the end of the blowpipe. The pipe is then set down onto a set of wheels over a bench where the objective is to use gravity to roll the glass so it spreads and blow air into the glass which also helps shape it. 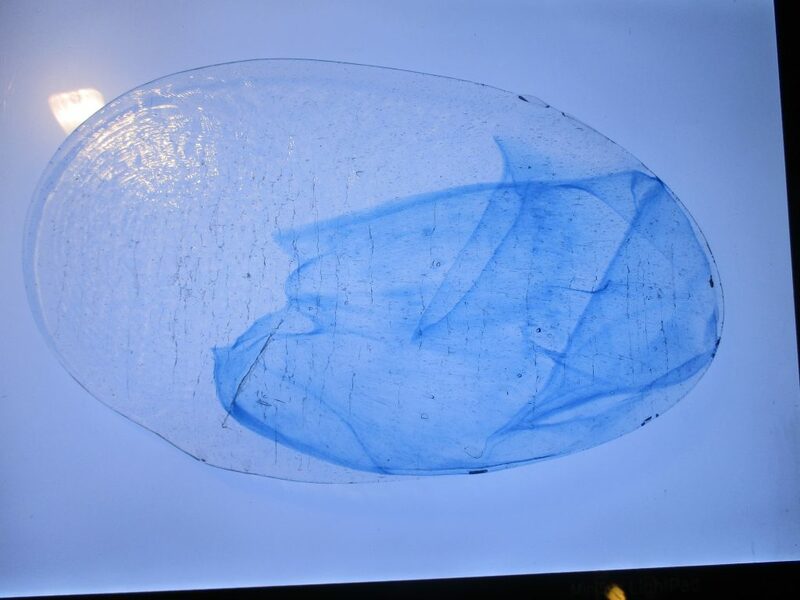 The glass cools very quickly once removed from the kiln so all this has to be dome very quickly as does the blocking (using a kind of wet scoop to ensure the blob is even) and using the tongs (called jacks) and a flat pad (called a paddle) to keep the edges even once its in a flat shape. (again after this the pieces were put into the Lehr as they were cooler than they had been in the furnace but still needed to be brought down to completely cold). As you may be able to tell from the photos choosing the colours and seeing the finished glass appear from between the rollers was very exciting and a lot of fun :-). After they had cooled down here are the results! 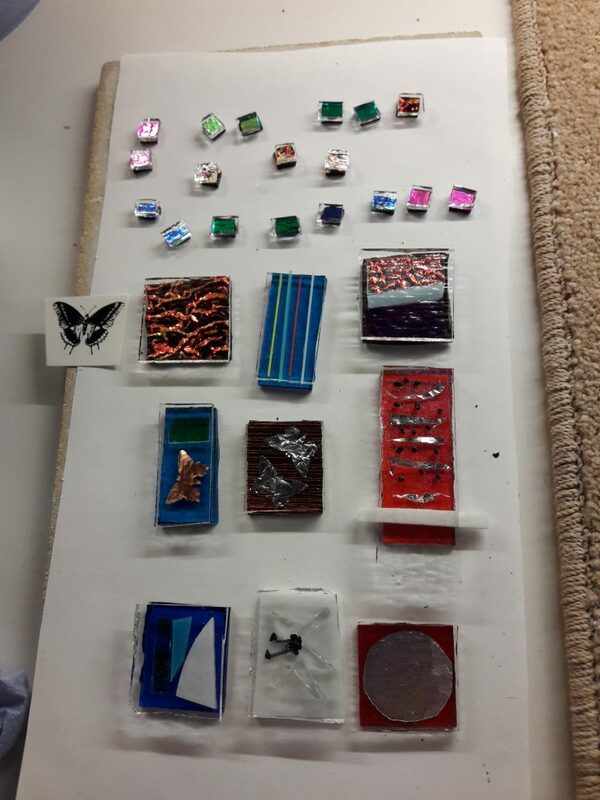 My third and final class was also at the Glass Hub but this time in warm glass, fusing jewelry (following on from a beginners class I had taken at Glass Jewels a couple of years ago). 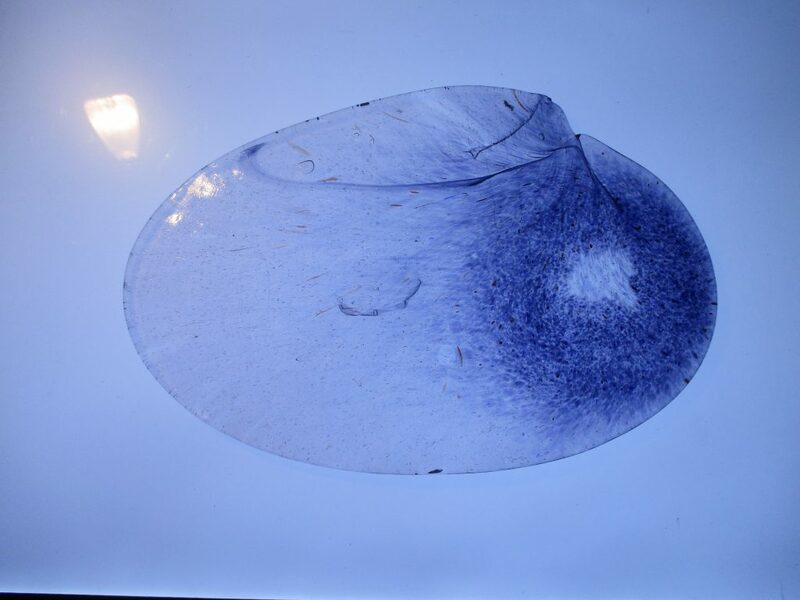 We experimented with inclusions, reactive glass, Striker glass – which i had never come across before – the flower below was made out of it – it goes in one colour and comes out a different colour, dichroic (glittery and pretty) and different ways of mounting or hanging finished pieces (the red piece below had a piece of kiln paper between the layers of glass so a chain or braid could be put through avoiding the need to glue on findings afterwards). Again like the other pieces we made these had to stay behind for fusing in the kiln but I was really pleased with my red oriental inspired piece and will definitely wear my moth inspired pieces! 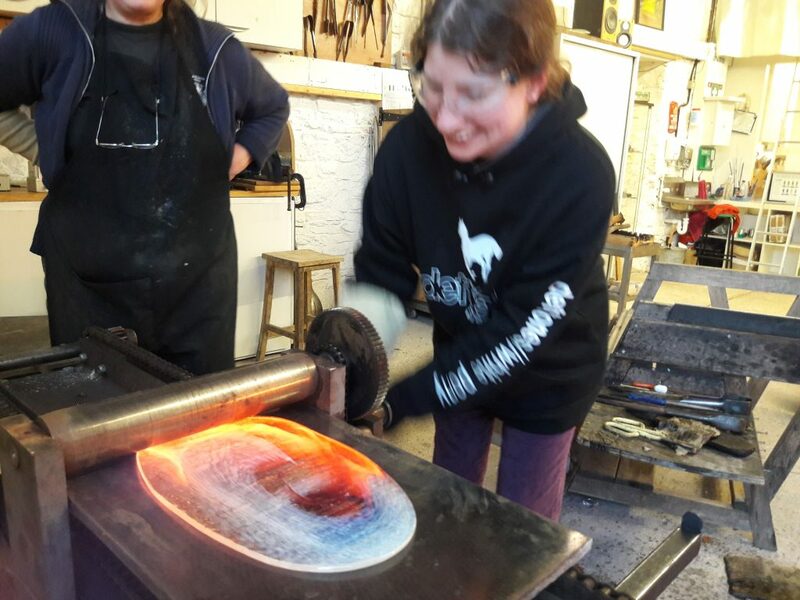 I did really enjoy the class & learned an awful lot from our fabulous teacher Helga Watkins-Baker but did have a bit of a wistful look at the hot glass class going on at the other side of the studio, I like warm glass but I think hot glass could become a bit of a passion & would definitely love to do more of it in the future! 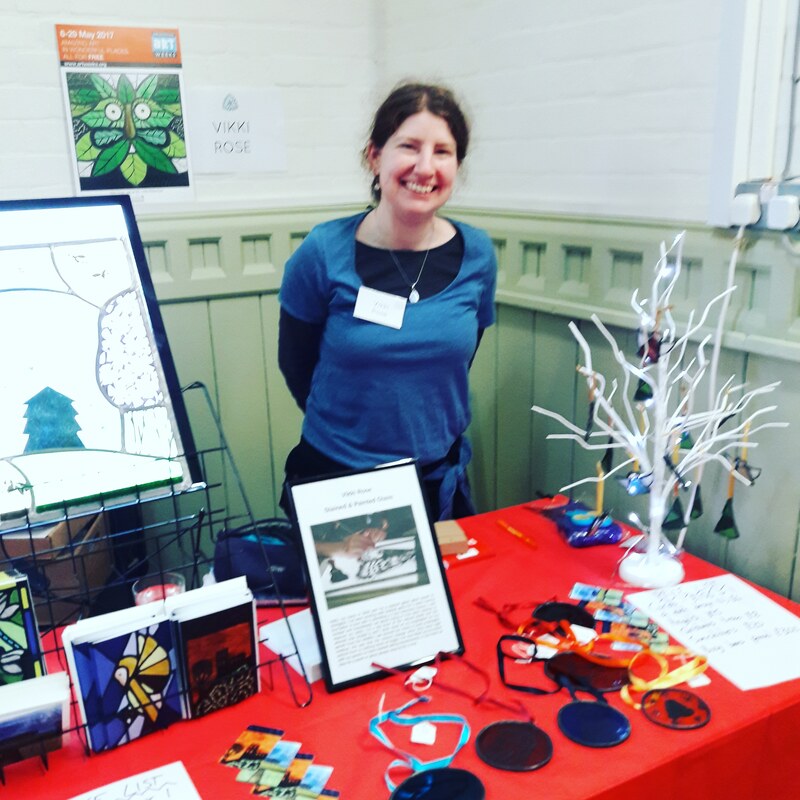 This entry was posted in Abingdon, Art, creative projects, glass, Handmade, making things, new year, stained glass. Bookmark the permalink. 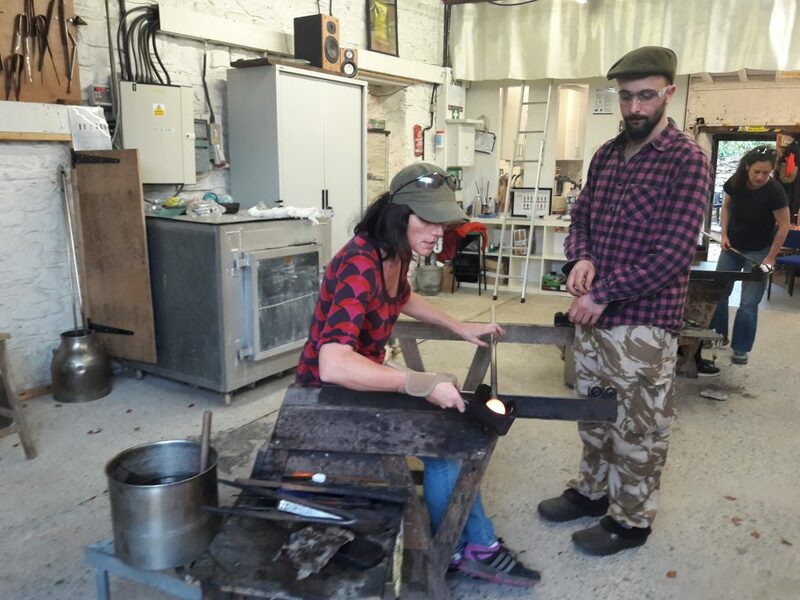 The glass blowing looks fantastic Vikki! I look forward to seeing what you make with it. 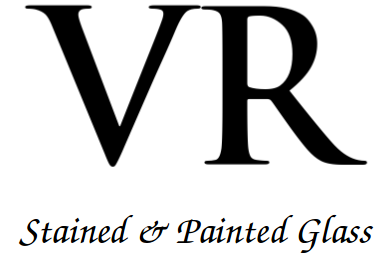 PS My website is under construction!